Laserfiche Solution Contributed By: Rich Maier, VP Information Systems, Caduceus Inc.
Caduceus is a medical service organization based in the New York City metropolitan area which provides revenue cycle, patient scheduling and credentialing services for hospitals and multi-practitioner practices. Here is how Laserfiche Workflow makes the process of issuing refunds for overpayment of co-pay or changes to enrollment fast and easy. Compiling the refund request documentation took approximately one hour, and the package spent five days in the preparation stage as it went from desk to desk for the different pieces of documentation. Sometimes the account status changed (for example additional research could be required) during the preparation stage, making the paper documentation obsolete. Once the documentation package was complete, either the hardcopy or scanned documents were sent to the client for approval and issuance of the refund check. 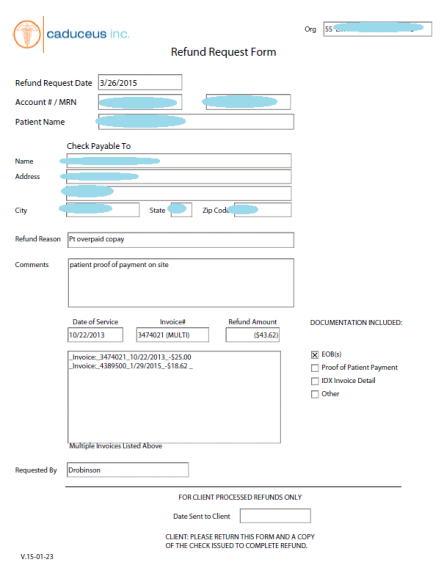 The client then sent a copy of the issued check back to Caduceus for inclusion in the documentation package. Finally, the package was scanned into Laserfiche for archival. 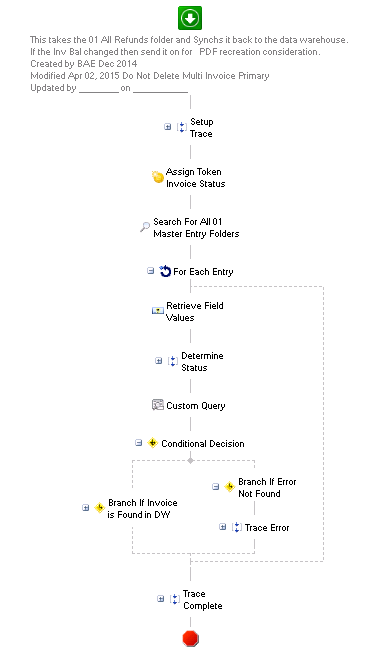 Each of the steps above required manual status updates in the tracking database. The new process is fully paperless and electronic. The Laserfiche folder structure is the key to the system and corresponds to the various steps of the process. As the refund request moves through the process, Laserfiche Workflow files it automatically in the appropriate folder for that step. Additional status folders are used for soliciting special help with the request or for denying/deleting the refund. Provisions are also made for creating a refund request manually without an active invoice in the medical billing system. The Laserfiche metadata is sourced largely from IDX and is supplemented with additional information (such as status and comments) gathered during the refund request process. Two workflows are key to keeping Laserfiche in synch with IDX. 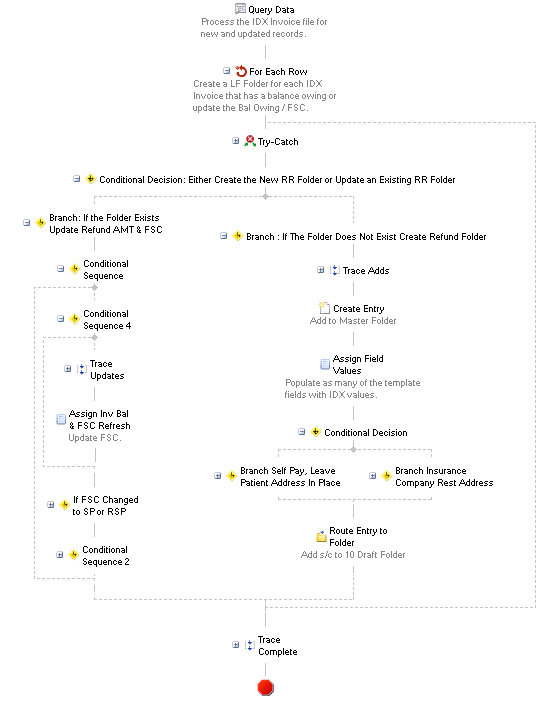 The workflows are scheduled in Laserfiche to run on a regular cycle. The first workflow adds new refund request folders to Laserfiche based on new activity in the medical billing application. 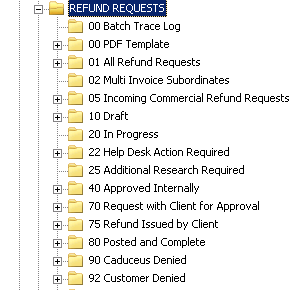 The second workflow takes each refund request folder from Laserfiche, updates the current refund amount and deletes the folder if it is reduced to zero dollars. This process is paperless by sourcing supporting documentation electronically from the Laserfiche archives and the medical billing system — reducing paper, printing and storage costs. Would you like to automate your own business process? Download a free copy of “How to Diagram Your Business Process” eBook.